In these days of environmental concerns, global climate change and pipeline protests, the oil and gas industry has become the target of much criticism. This was not the case around the turn of the last century when, in the middle of the Texas Oil Boom, attention was focused on a small fishing village at the mouth of the Fraser River. The existence of natural gas on Lulu Island had been known for millennia. The Musqueam fishing camp at Terra Nova was named sp`’elekw`eks (pronounced SPALL-uk-wicks), “Bubbling Water” in English, referring to the gas which was visible bubbling through the water in the slough. 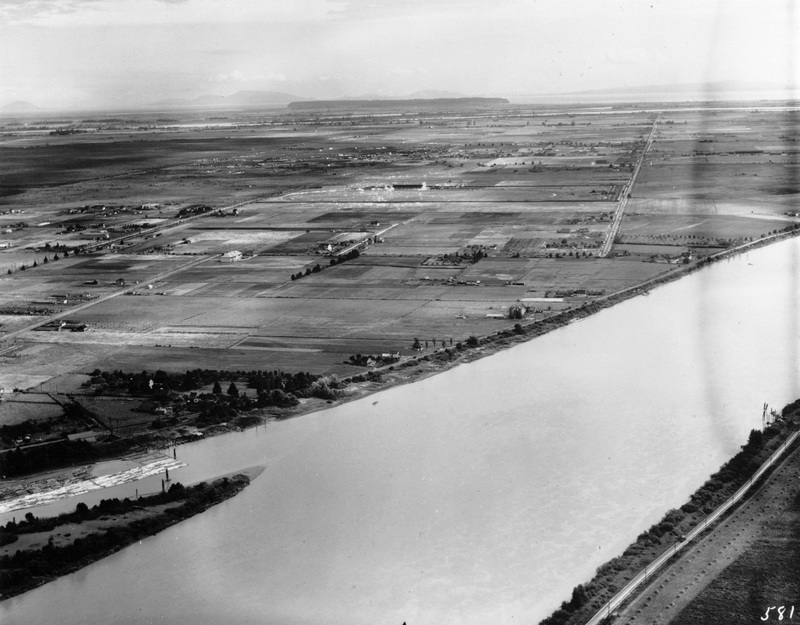 The Musqueam village at Garry Point was known as kw’áýò7xw’ (pronounced KWAY-ah-wh), meaning “Boiling (bubbling, churning) Water” in English, referring to the gas bubbling in the Steveston Slough. Early European settlers in Steveston were also very aware of the gas deposits beneath Lulu Island. In 1891 the Steveston Enterprise Newspaper reported that the natural gas “forces its way through the water that accumulates in the wells and ditches where it is exposed and blackens the soil with heat when it is consumed.” Tossing a match into the bubbles would cause them to ” flash like powder”. Tipping a barrel over a gas vent would collect it and produce a continuous flame at a hole in the top of the barrel. 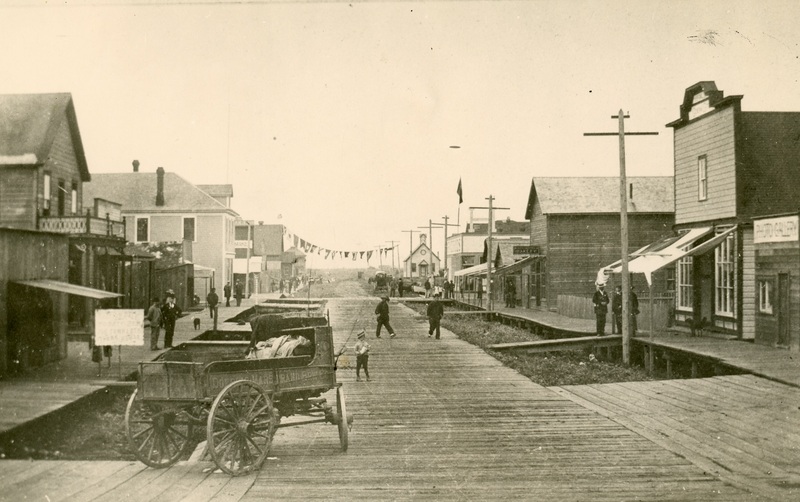 Steveston in 1891 looking North up 2nd Avenue. The sign on the left advertises the land auction of June 16. City of Richmond Archives photograph 1984 17 75 . Word of the gas spread with advertising for land auctions in the area. An ad in the Victoria Colonist invited people to bid on 400 lots available in Steveston, “The Key City on the Fraser River”. According to the ad, participants would see the natural gas burning, its presence sure to make the area a manufacturing centre and a leading city in the Province. The presence of the colourless, odorless gas led to efforts to exploit this resource. In August 1891 the Steveston Natural Gas and Development Company was formed by a group of local entrepreneurs who attempted to start a well but found their expertise and capital were not up to the task. The evidence of natural gas led to the speculation that large oil or coal deposits would also be found in the area. In 1904 an organization of Vancouver businessmen, The Steveston Land and Oil Company Limited, bought a lot on No.1 Road in Steveston, east of the end of Broadway Street and next to the Japanese Hospital. They hired some experienced oil riggers and engineers from the oilfields at Beaumont, Texas. 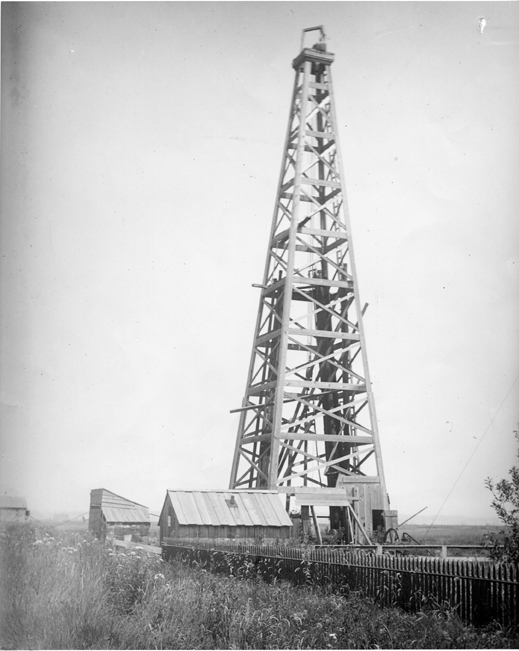 A derrick was erected and drilling began at British Columbia’s first officially recorded well. The results were encouraging and by April the shaft had reached 1000 feet, passing through “shale, clay, and blue, greasy mud or gumbo”. In June, The optimism spurred the company to look for more investors and ads were placed in newspapers announcing that 30,000 shares were available in the company. Hoping to attract sales, the company offered early buyers a “buy two, get one free” deal. 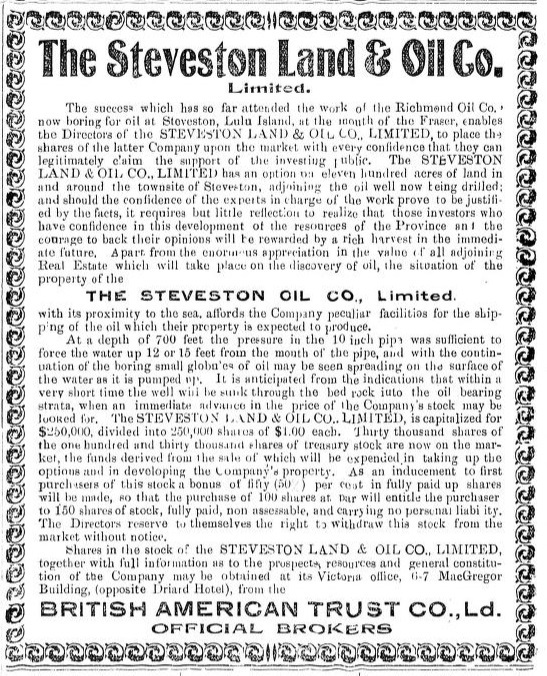 An ad from the Victoria Colonist, June 1904, inviting investors to buy stock in the Steveston Land and Oil Company. 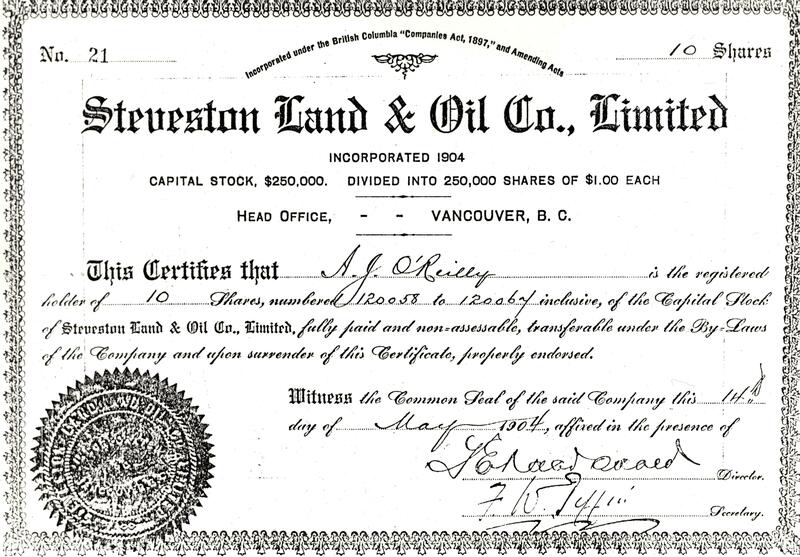 A copy of a share certificate for the Steveston Land and Oil Company. City of Richmond Archives photograph RCF 47. In August the excitement grew when a large pocket of natural gas was reached by the drillers. The pressure sent sediment and water spouting high over Steveston. That evening a burn off flare was ignited to expend the gas and the resulting flame was 80 feet tall and 18 feet wide and could be seen from New Westminster. 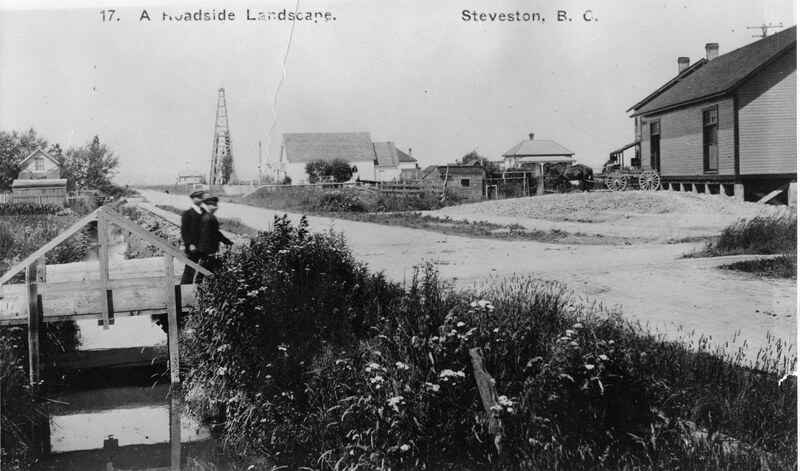 Reports claimed that the drillers expected to hit high quality oil soon, after which Steveston would take her place among the world’s great oil fields. 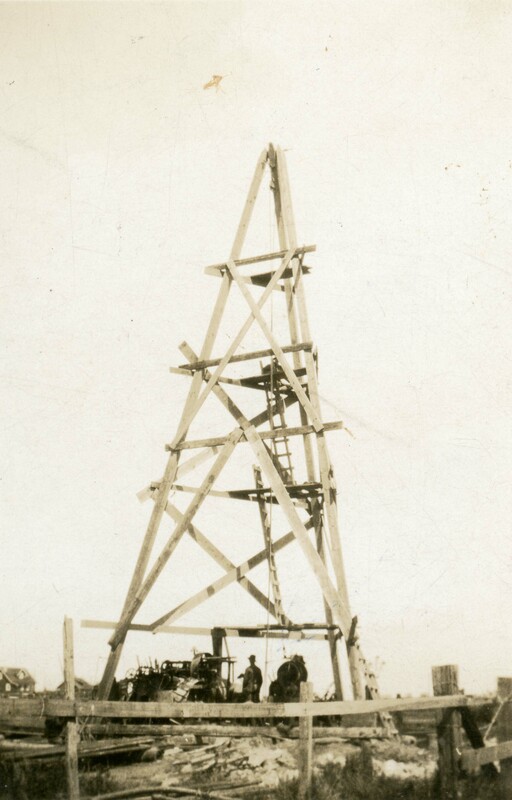 The drilling rig of the Steveston Land and Oil Company in 1904, B.C.’s first documented oil well. Sections of well piping can be seen leaning against the structure. Investors had high hopes that Steveston would be sprouting with derricks like this and black gold would be flowing from deposits under Lulu Island. City of Richmond Archives photograph 1978 15 10. Despite all the optimism surrounding the search for oil, problems were arising. Oil was certainly present under Lulu Island, droplets had even shown up at the well, but the silt surrounding it was so flour-like that even with fine screens the piping would plug immediately. 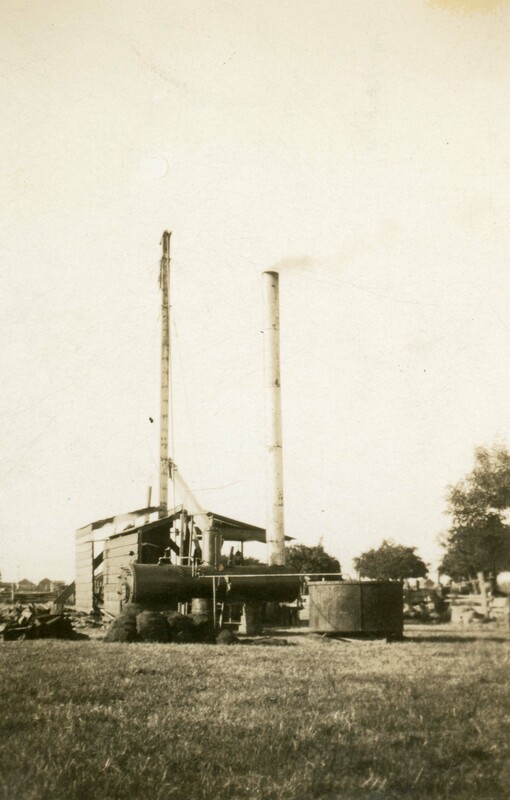 More expensive equipment and more specialized screens were shipped to the well but eventually the costs of operation overwhelmed the company and the project was abandoned in 1906. Looking north up No.1 Road in 1908 gives a view of the back of the Steveston rail station, a Roman Catholic Church and the now defunct drilling rig of the Steveston Land and Oil Company, City of Richmond Archives photograph 1978 5 7. The halt of operations, while saving Steveston from the fate of becoming surrounded by oil wells and a busy tanker port, did not entirely stop the idea that natural gas might be a viable product. In 1930 a well was drilled on the farm of Henry Fentiman at 120 Garry Street. Mr. Fentiman’s house was located at the north side of the present Steveston Community Park, not too far from the location of the old oil rig. Henry Fentiman’s turn of the century mansion on his Steveston farm. City of Richmond Archives photograph 1986 54 1. The International Pipe Line Company invested $17,000 in a plan to supply Vancouver with superior, odorless natural gas from Lulu Island, supplanting the manufactured gas used in the city at the time. The first test well was drilled to a depth of 850 feet, produced a flow of gas, but soon plugged with sand. A second well, drilled in 1931 to a depth of 730 feet and using finer screens to separate the sand, proved to be more successful and produced a steady flow of gas. Drilling for gas on the Fentiman farm. City of Richmond Archives photograph 1978 36 22. Once again the plan to capitalize on the energy resources of Lulu Island did not come to fruition, but Mr. Fentiman used the gas from the well for decades, easily heating his big, drafty turn of the century house, running his water heater and stove using the apparently unlimited supply of gas from his property. The only complication encountered with the system was the fluctuation in gas pressure caused by changing tides, the gas having to force its way through the whole depth of water in the well. Henry Fentiman’s gas well, shown here in the 1930s, kept his house heated, water hot and kitchen cooking for decades. City of Richmond Archives photograph 1978 36 21. In 1969 with the gas well now capped off, the Fentiman property was expropriated for $70,000 by City Council. The buildings were demolished in the late 1970s. 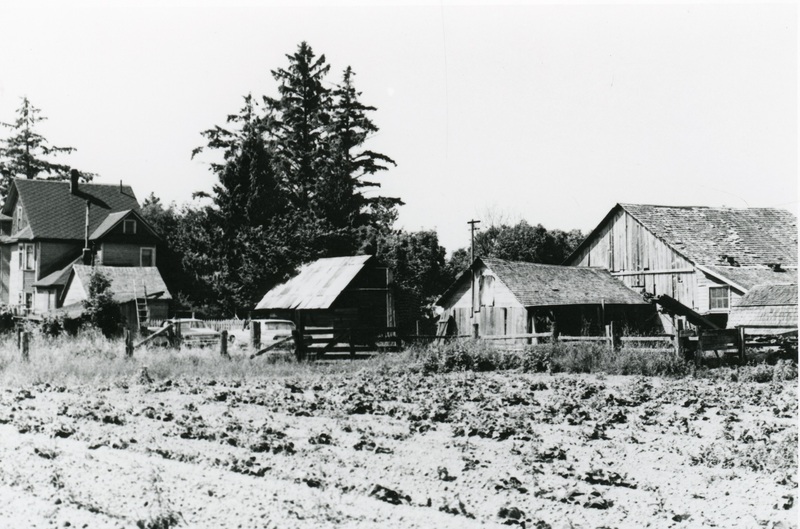 The farm was sub-divided and exchanged or used for other purposes, the northern part now home to the Steveston Buddhist Temple, the Lions Club Senior Citizen housing occupies a portion of the old property and the southern part, where the Fentiman house and gas well were located were absorbed into Steveston Park. The natural gas and oil deposits that created so much excitement in the early 20th Century are still there, captured in the earth below Lulu Island but are unlikely to be looked for again. The Fentiman house and outbuildings in the late 1970s. The gas well was located in the small building between the house and the barn. City of Richmond Archives photograph 1986 54 8. Richmond is truly a child of the Fraser. The City is built on islands in the delta of the Fraser River which were formed, starting about 11,000 years ago, by the deposition of silt and sand on top of glacial deposits from the last Ice Age. Solid bedrock sits more than 200 meters below the surface. Averaging about one meter above sea level with areas subject to flooding during high water, the islands were drained by a vast system of sloughs which allowed rainwater to run off to the river as well as allowing fresh river water to flow in and out with the tide. The shorelines of the islands changed continuously with the action of the river and tides, sections washing away during spring freshets and other areas growing though deposition of silt. At one time Lulu Island was separated into two islands by a channel, named Daniel’s Arm by Archaeologist Dr. Leonard Ham, which flowed northwest from Lion and Don Islands on the South Arm to the North Arm at Mitchell Island, the last vestige of this being Bath Slough. This 1935 aerial photo of Richmond clearly shows the former path of the channel known as Daniels Arm, a strip of farmland in this view, separating the east and west Richmond bogs. 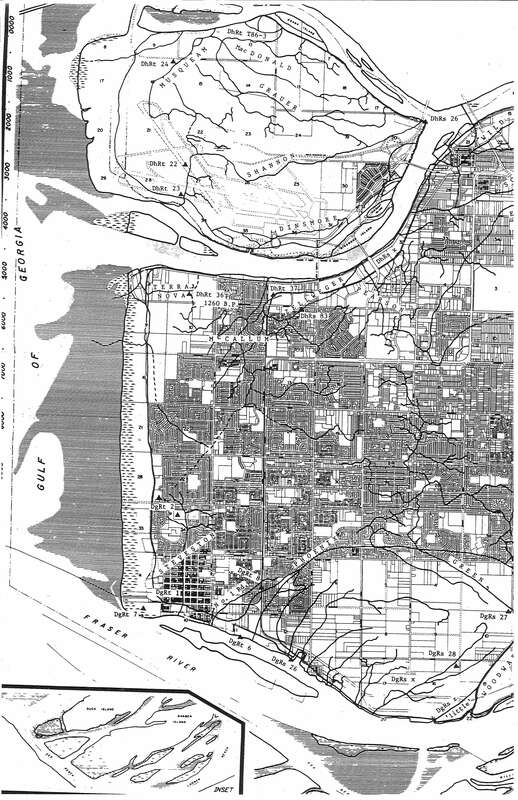 City of Richmond Archives map. The low, slough-drained grass and shrub lands that supplanted the former track of this channel, which filled in around 1000 years ago, separated the east and west Richmond bogs, large sphagnum and cranberry bogs. The west part of Lulu Island was mostly slough-drained grass and shrub land, bordered on the west by the Crabapple Ridge, formed on an early beach berm. The higher banks of the island were edged by clusters of wet coniferous forest, spruce forests and alder scrub. 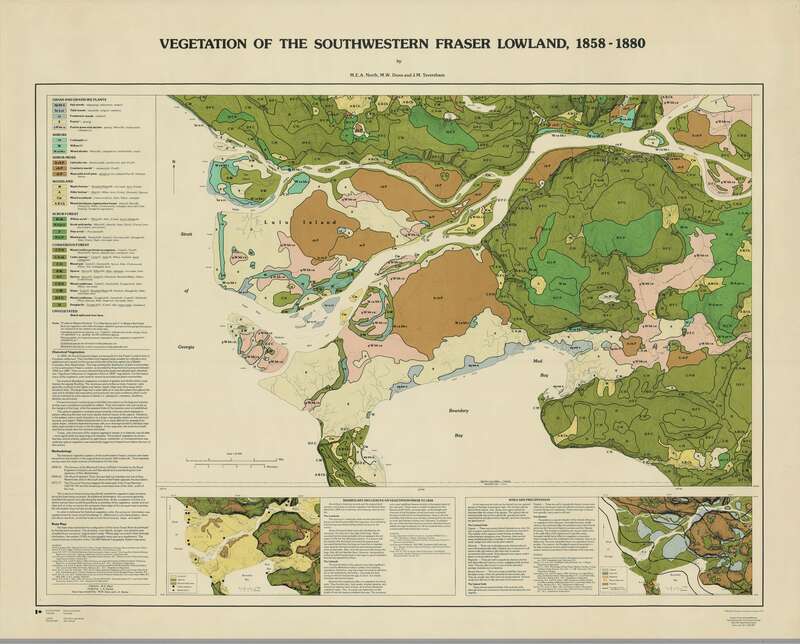 This map shows the types of vegetation existing in Richmond and the rest of the Fraser Lowlands between 1858 and 1880. City of Richmond Archives Map 1987 76 8. The vegetation on Sea Island was mostly spruce forests on the east and central portions and grasslands and scrub around the north, west and south parts of the Island. To the Coast Salish peoples of the area, Richmond’s islands were gardens, with cranberry bogs, crab apple trees and plentiful other plant resources. Deer grazed in the grassland and the sloughs were home to beaver, muskrats and mink as well as spawning salmon. Sturgeon and salmon were available in the river as well, and wildfowl were plentiful, especially during migration cycles. The natural sloughs were important transportation arteries, giving access deep into the islands. More than 100 km of the sloughs were navigable by canoe. 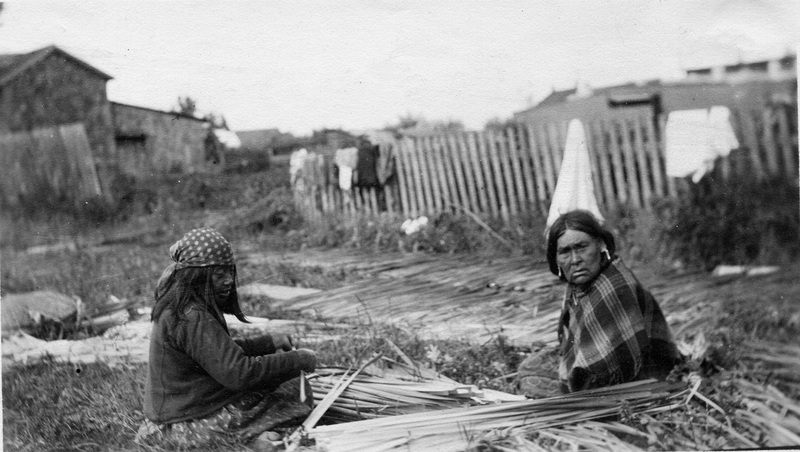 This photo taken in Steveston in 1909 shows two First Nations women gathering reeds, still using the resources in their traditional territory. City of Richmond Archives photograph 2004 15 2. It is estimated that the population of the land now called Richmond was 1000 to 2000 people during the winter, but swelled to perhaps ten times that many during other times of the year, especially during the fishing season. Archaeologists estimate that as many as six permanent house sites existed on Lulu and Sea Islands as well as many fishing and short term camps, salmon weirs and other miscellaneous sites. The smallpox epidemic of 1781 decimated the population of the area leading to the abandonment of most of the sites, although many continued to be used by the First Nations peoples well after the arrival of European settlers. 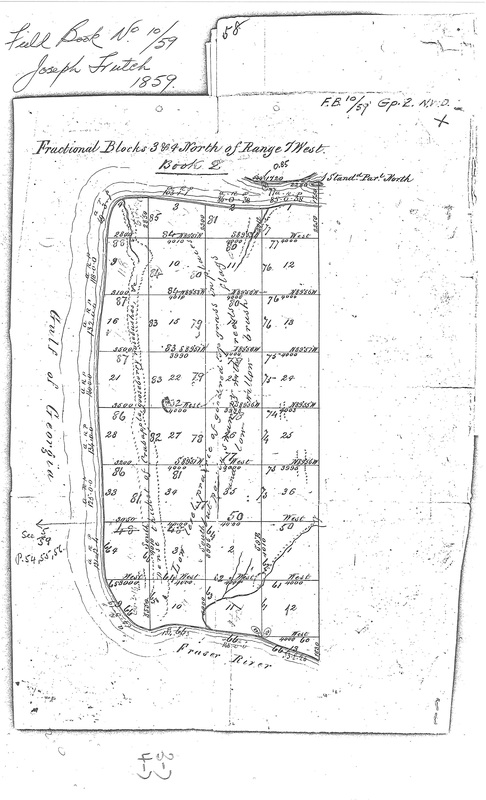 This is a copy from one of the original surveyor’s field books used by Joseph and John Trutch when they surveyed Lulu Island in 1859, showing some details of the land and vegetation of Lulu Island at the time. Trutch Field Book #10. Richmond’s Islands were first surveyed in 1859 by Joseph and John Trutch who were awarded a contract from the Colonial Government to survey land along the Fraser River. From this survey we can glean some information about the land and vegetation of Richmond before European settlement. 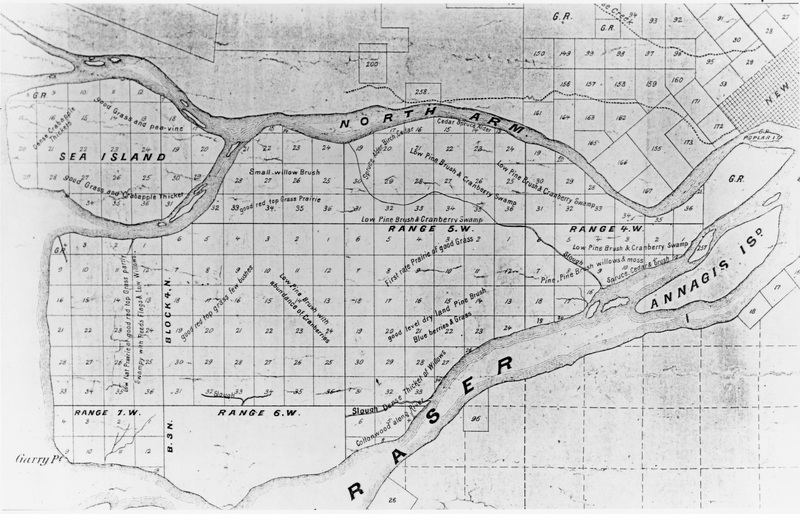 Missing on the 1859 survey is a large block of land in the South Arm “Slough District”, comprising Block 3 N Range 6 W, apparently skipped at the request of the Hudson’s Bay Company who were still actively trapping beaver there at the time. The survey of that section was completed by J.A. Mahood in 1874. This early map of Richmond is based on the Trutch survey drawings and shows notes on vegetation. Note the blank space at the South Arm “Slough District”, an area not surveyed at the request of the Hudson’s Bay Co. City of Richmond Archives photograph RCF 17. Early European settlers used the slough complexes for transport, much as the First Nations people had but, with the construction of roads through Richmond the sloughs became a hindrance to development, rather than the benefit they had been. Farmers and road builders built ditches and canals, dyked their property to prevent flooding and filled in the original sloughs. By the end of the First World War most of the natural sloughs in Richmond were gone. This detail of a map of the Sloughs and Archaeological Sites of Richmond shows the original main slough channels which existed. Archaeological sites are marked with triangles. 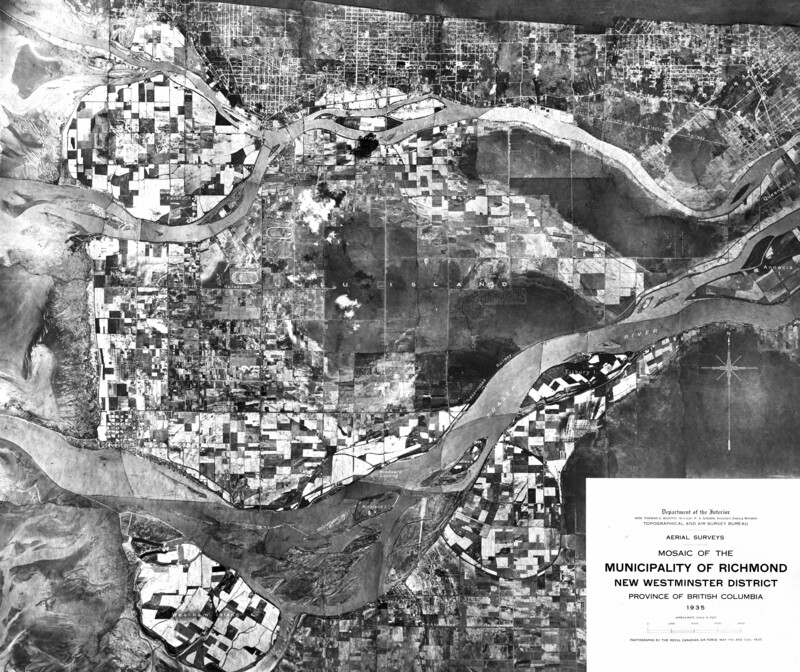 City of Richmond Archives Government Publications GP 316 – An Archaeological Heritage Resource Overview of Richmond BC – Leonard Ham – 1987. Today very little of the original slough system remains and Lulu and Sea Islands are completely encircled by dykes with drainage systems and pump houses removing water from the land. Few people are aware of the original geography, vegetation and prehistory of the islands they call home. 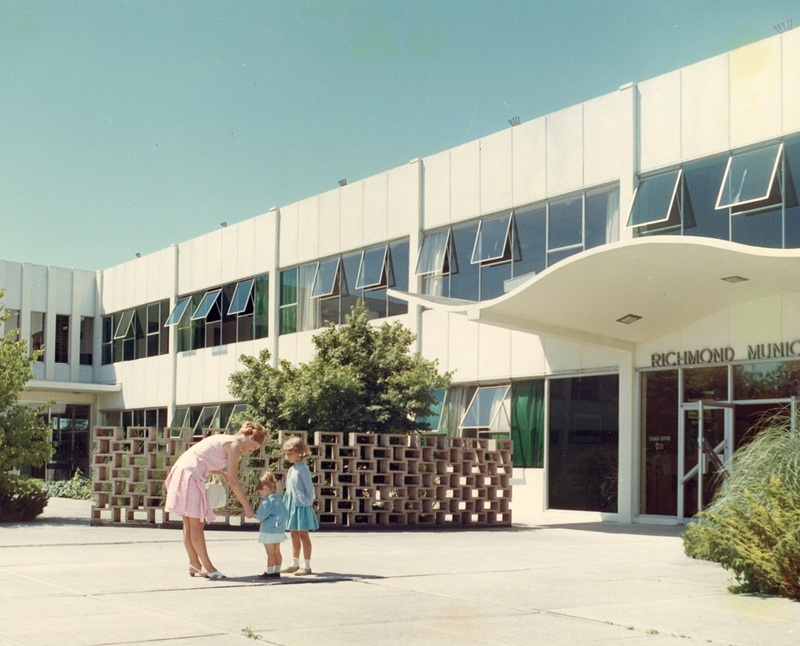 The City of Richmond was incorporated in 1990 and by then it was already obvious that the 1957 City Hall, even with its additions and improvements, was becoming unsuitable for the rapidly growing city. Staff reports detailed the inadequacy of the office space and the inefficiencies of operation in the existing facility. Council and senior city staff identified issues with the existing building and began studies to determine what was needed to meet the city’s requirements for the foreseeable future. 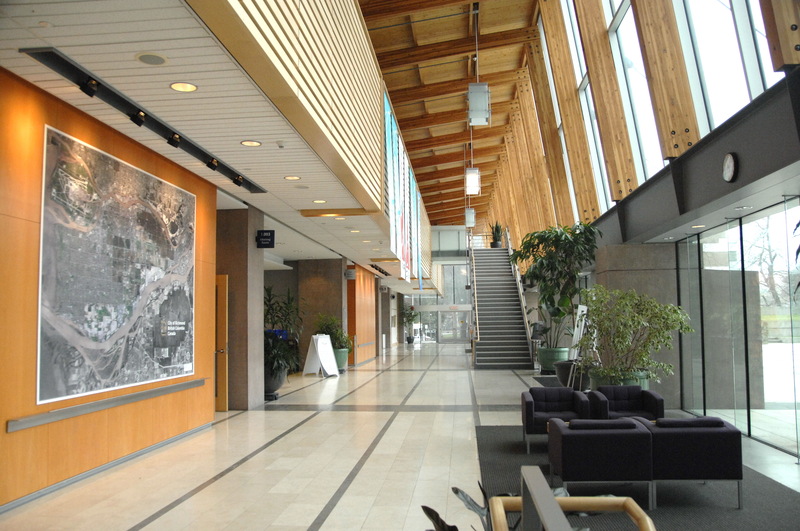 The third Richmond City Hall had been outgrown by the Municipality it had been designed to serve, even with nearly continuous upgrades and additions. Staff at the hall pose outside before the building was shut down and demolished. City of Richmond photograph. 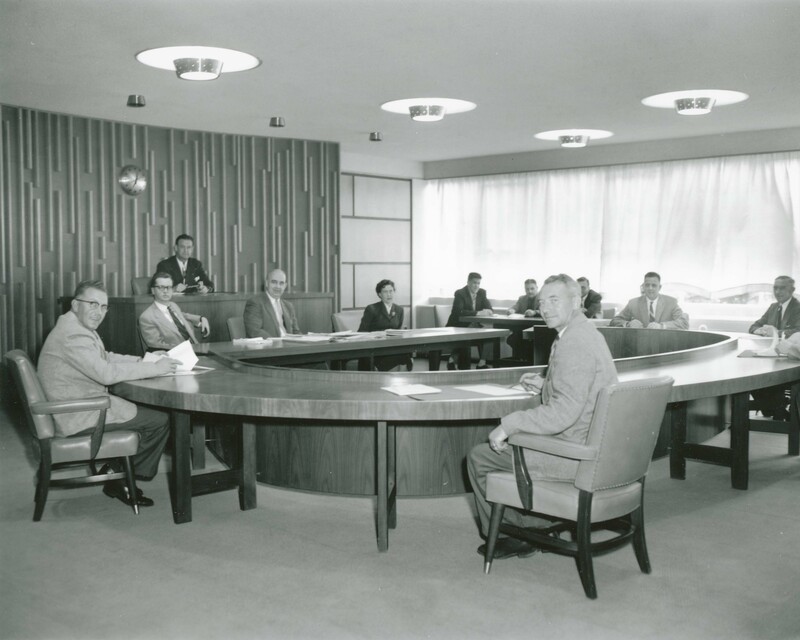 In 1991 a Task Force was formed to explore the space requirements, cost benefits, and feasibility of the construction of a new City Hall. Many considerations were made regarding the construction of a new building over the modification of the existing one, the suitability of the location, and the design of a potential replacement. Detailed analysis found that the cost of upgrading the existing building would be at least 75% of the cost of a new facility. 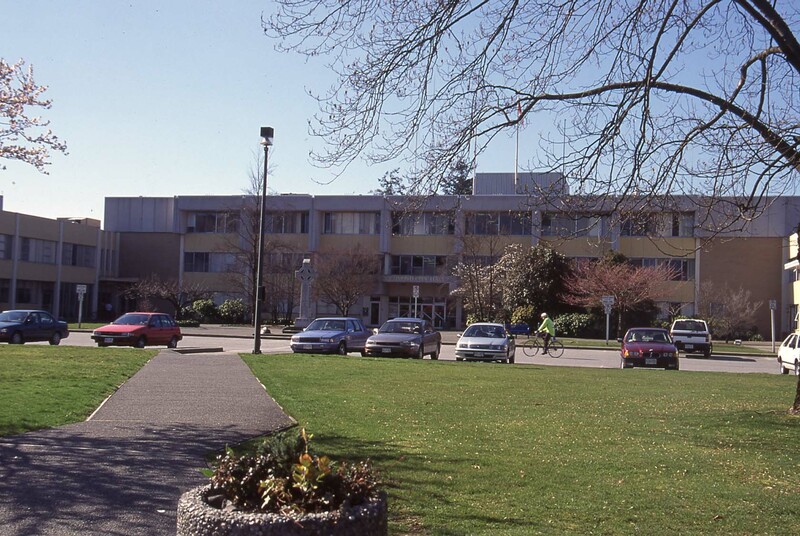 City owned and privately owned properties were considered as potential sites for a new hall but the location of the existing City Hall with its proximity to the School Board offices, RCMP Station and the new Cultural Centre, Senior’s Centre, Minoru Park, Arenas, and Brighouse Park, all fit in with the concept of a “Civic Centre” at the heart of Richmond’s City Centre. The Task Force also identified the opportunity to create an landmark building for the community. 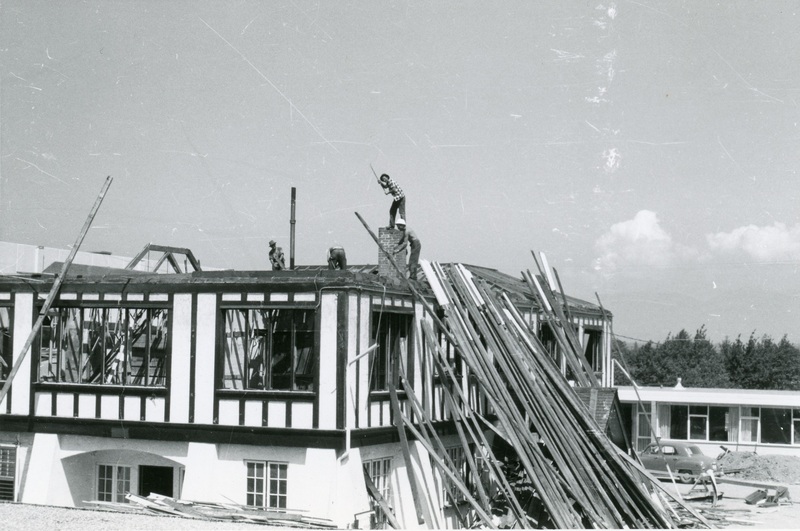 After demolition of the old hall, site preparation and construction began. 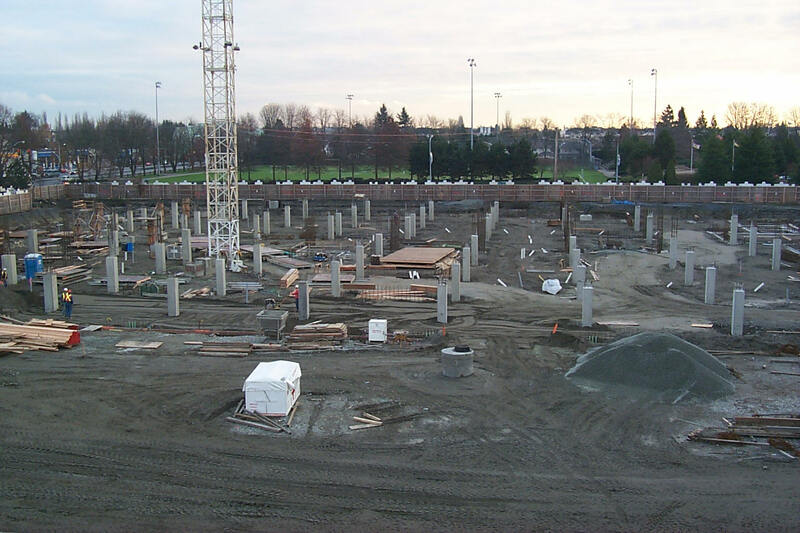 The under-building parking is a few feet below the water table and features a pump system to keep it dry. City of Richmond photograph. By 1996 work on the project had progressed to the point where project management and architectural services, provided by KPMB Architects of Toronto, had been settled on. Mayor and Council formed a building committee and in 1997 city operations were moved from City Hall to another city owned property on Elmbridge Way to allow demolition of the old building to take place and site preparation and construction of the new one to begin. 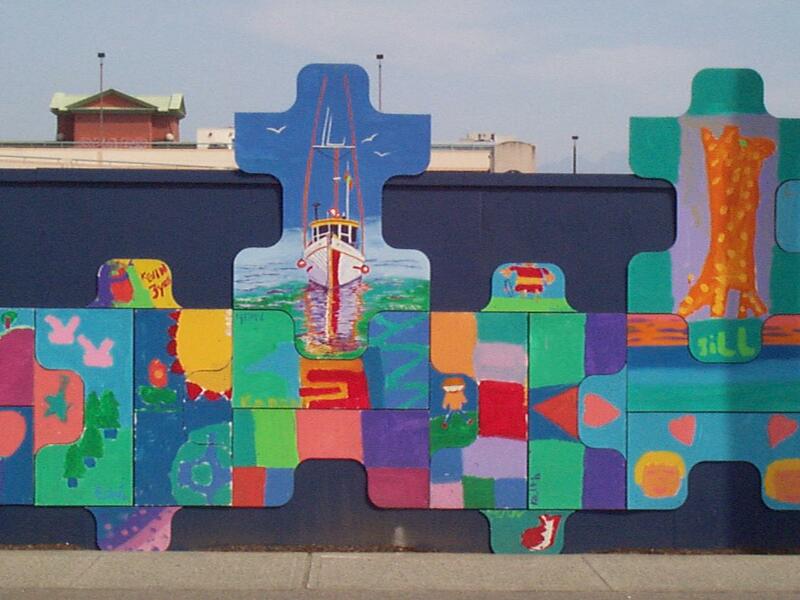 A public art project decorated the wall around the construction site on Granville Avenue. Two hundred plywood puzzle pieces were painted by more than 600 residents during the 1998 spring break at Lansdowne Park Mall. City of Richmond photograph. The new building, unlike its predecessor, returned to the practice of the first two Town Halls, making space available for community events and public use. The award winning design featured four major building components. 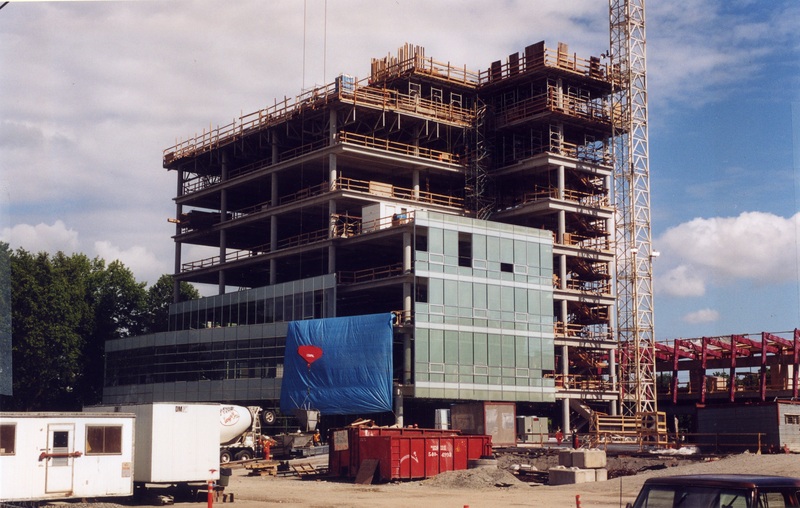 In 1999 construction of the new City Hall was underway. City of Richmond Archives photograph. The eight storey administrative tower includes the first floor “Front of House” area which clusters representatives from various City Departments in one area to provide one-stop-shopping and improve customer service. The Administrative Tower, shown here looking south east, rises eight storeys at the corner of No.3 Road and Granville Avenue. City of Richmond photograph. The circular council chamber over looks the southern terrace water garden which features an island to represent Richmond’s status as an Island City and is landscaped with native plant species. Looking over the Water Garden toward the Council Chambers in the background. City of Richmond photograph. 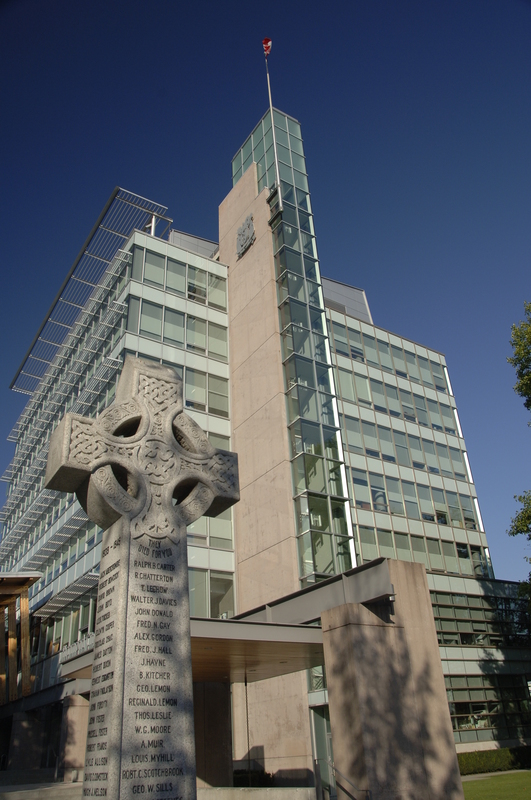 The light filled, two storey Meeting House wing houses a variety of open public spaces and multi-purpose rooms and offices and extends to the west of the tower. The two storey Meeting House features natural light, natural wood finishes, a mix of office and meeting spaces, public areas and a cafe. City of Richmond photograph. 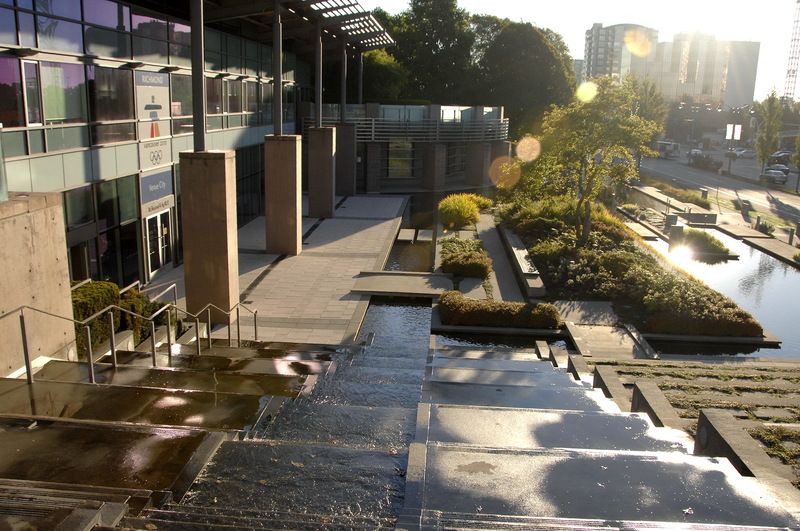 The west terraces and civic square feature an outdoor stage, gardens, public art and access to the administrative tower and the Meeting House from the public parking area. 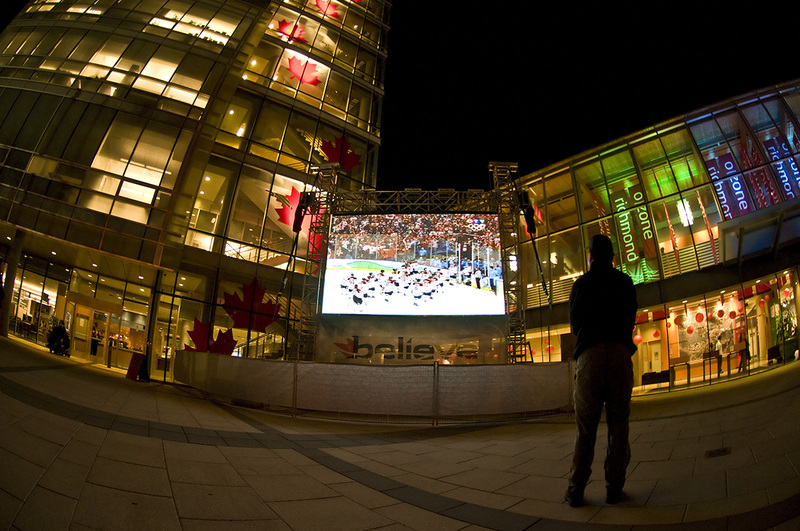 The West Terraces and Civic Square were an integral part of the O Zone during the 2010 Olympic Winter Games providing a large screen for watching events. Russ Bueker – City of Richmond Archives photograph. The reconditioned Cenotaph was replaced within feet of where it was originally sited in 1922. City of Richmond photograph. 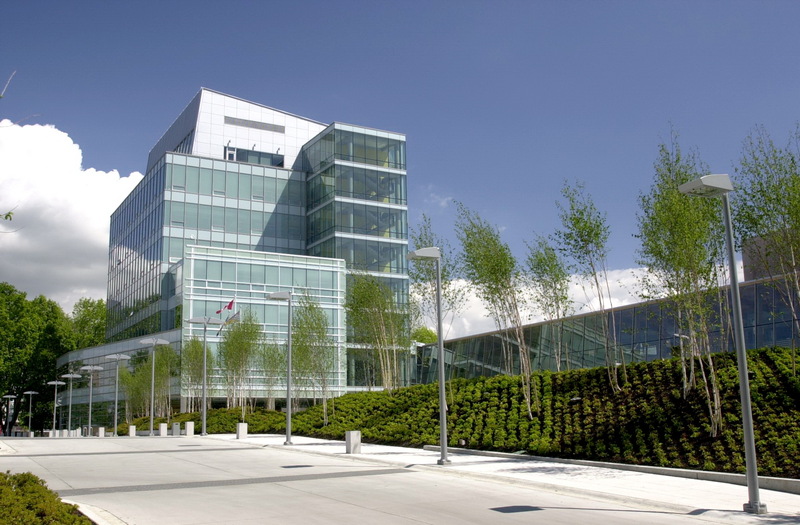 The building, which cost around $39 Million to build, is designed with the best available technology to withstand earthquakes, provides good public accessibility and an effective, pleasant and safe workplace for employees. The new City Hall opened for business on May 15, 2000 and several celebratory events were held afterwards. On May 20 an Official Opening Ceremony took place. This was followed by a Charity Gala on May 26, attended by more than 1200 guests. On June 6 the cenotaph, which had been refurbished while in storage during the construction project, was rededicated. It was installed very close to its original location on No.3 Road near the main entrance to the building. On June 12 a Recognition Social was held, attended by more than 1000 residents who had lived in Richmond for 50 years or more. 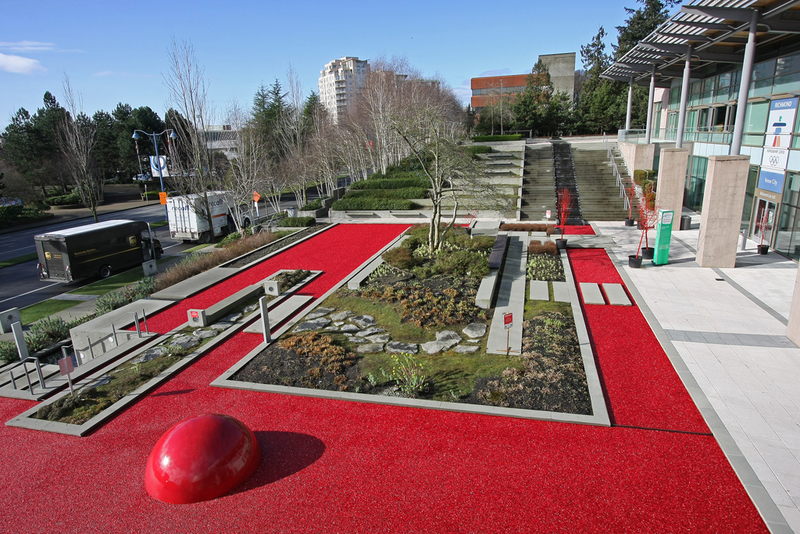 During the 2010 Olympic Winter Games the Water Garden at City Hall was filled with cranberries from the local harvest. Brian Phillips – City of Richmond Archives photograph 1_3824. In the nearly 140 years since the opening of the first Richmond Town Hall, Richmond has grown dramatically, a trend which continues. The first hall served a population of 250 to 300 people at a time when Richmond could still be considered a frontier settlement. By 1919 when the second hall was opened, the population had soared to 3110. In 1957 the third hall was built to provide services for a community of around 26,000 people. The present City Hall was built when the population was around 150,000, a number which is estimated to have swelled to 222,945 today. With the growing service requirements needed to operate our expanding city, space has again become tight at the hall. Some city departments have moved from the main hall to the City Hall Annex, the former Public Safety building vacated by the RCMP in 2011, which has alleviated crowding for, so for the foreseeable future, our fourth City Hall will continue to serve as our Centre of Government. Brighouse is a name that has been associated with Richmond’s main retail and business district since the days before there was any retail or business done there. 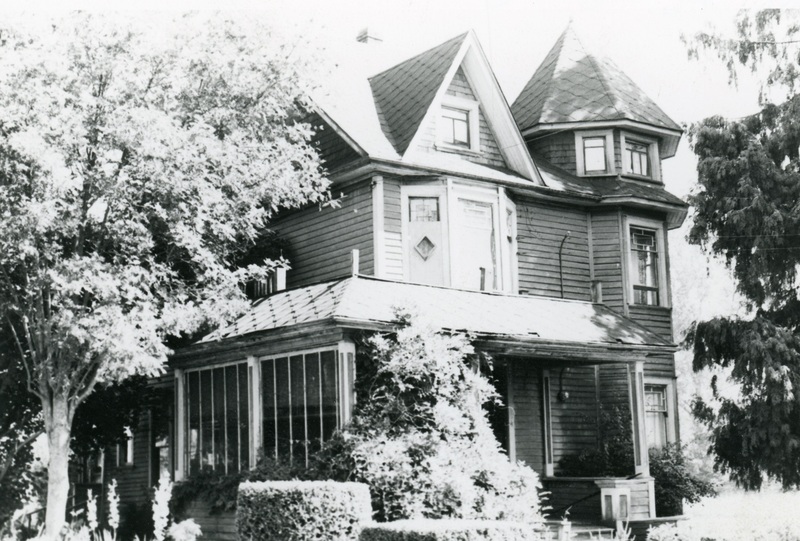 There is no question that the name Brighouse comes from Sam Brighouse, once the owner of the property on which City Hall and Minoru Park are now located but why did the area, part of Richmond’s City Centre, get and keep that name? 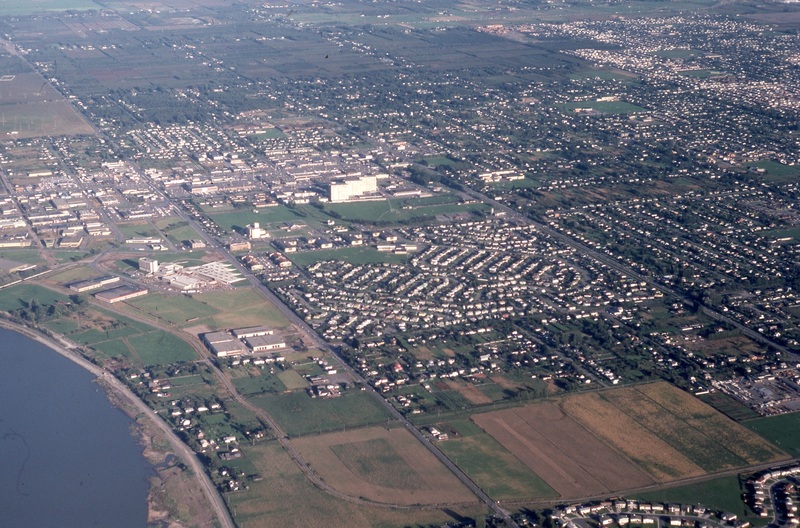 This 1976 aerial view shows most of the Brighouse lands, extending from Granville Avenue toward the river. The Brighouse subdivision can be seen at centre. City of Richmond Archives photograph 2008 36 3 79. Samuel Brighouse, ca. 1860. City of Richmond Archives photograph RCF 32. Samuel Brighouse was an prominent early settler, land owner, farmer and businessman in the Lower Mainland. He was born in Yorkshire in 1836 and at the age of 26 years sailed from Milford Haven with his cousin John Morton to New York and then to Panama, to San Francisco and then to New Westminster, a trip of almost two months.The two men made their way to the Cariboo gold fields and, finding prospects poor there, made their way back to New Westminster, making the trip both ways on foot. Brighouse and Morton partnered with William Hailstone in November of 1862 and purchased 555 acres of land in what is now the West End of Vancouver, some of the most valuable land in the country today. The three men, who became known as “The Three Greenhorns”, built a cabin and spent a couple of years clearing trails and living on the property. In 1864 Brighouse, who had been looking at farmland in the Fraser Valley and speculated that it may become quite valuable, acquired 697 acres of land on Lulu Island, some preempted and some purchased from original preemptors. The property today is bounded on the east by No.3 Road, on the west by No.2 Road, on the south by Granville Avenue and on the north by the river. This aerial view looking south, ca. 1925, shows a portion of the Brighouse property on the right, extending east to No.3 Road and south from the Richmond United Church to Brighouse Racetrack on the south. City of Richmond Archives photograph 1985 166 1. Brighouse farmed crops and livestock on the property, building a successful operation and erecting the largest barn on the Fraser River. He purchased another property near New Westminster called Rose Hill, building a dairy farm there. He operated both of his ventures until 1881, when he leased out his farms and returned to his property on Burrard Inlet. An old barn on the Brighouse lands, ca. 1973. City of Richmond Archives photograph 1977 16 13. Brighouse was one of the signatories on the petition for the incorporation of the Township of Richmond and he served briefly on Richmond Council in 1883, although he no longer lived there. He served two terms as one of the first Councillors in Vancouver. Sam Brighouse focused his attention on Vancouver and its development after leaving Lulu Island and made a fortune selling his property there after the arrival of the Canadian Pacific Railway. He retained a great deal of his wealth by never selling his Richmond farmland, instead leasing it to other farmers. Richmond’s first Municipal lands were purchased from Sam Brighouse for $400 in 1880. 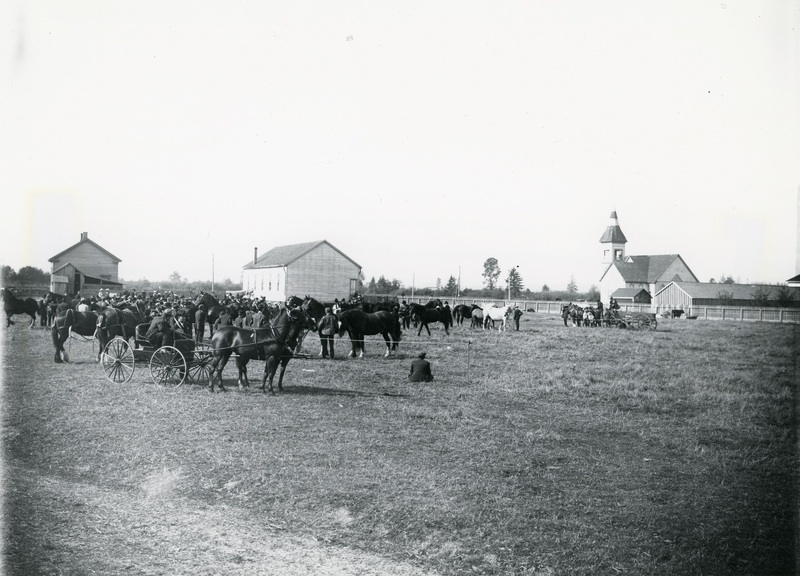 Shown are the Town Hall, left, the Agricultural Hall, centre, and the Richmond Methodist Church, now Minoru Chapel, at its original River Road at Cambie location. City of Richmond Archives photograph 1977 9 18. In 1880 Brighouse sold five acres of his Lulu Island property at the present intersection of River and Cambie Roads to the fledgling Corporation of the Township of Richmond where the first Town Hall was built. Sam Brighouse’s later life was marked by ill health and he returned to his native Yorkshire in 1911 where he passed away in 1913. Michael Wilkinson Brighouse, Sam Brighouse’s nephew and Heir. 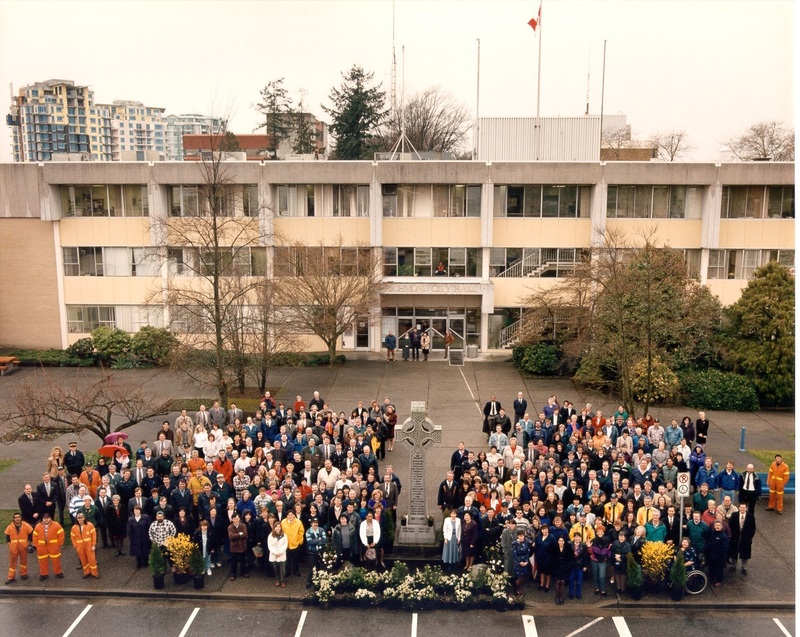 City of Richmond Archives photograph 2001 9 3. Brighouse was joined by his nephew Michael B. Wilkinson in 1888 who helped his uncle with the running of his farms as well as investing in canneries. He changed his name to Michael Wilkinson Brighouse, a condition of his uncle’s will, and became Sam’s heir. In 1909 Sam Brighouse sold a portion of his land to a group who built Richmond’s first racetrack, Minoru Park, named for the 1909 Epsom Derby winner. The track went out of business in 1914 with the First World War and the property was bought back by Michael Brighouse and reopened as Brighouse Park Racetrack in 1920. Michael W Brighouse kept the Brighouse name in the public consciousness through his business and political activities. He served two terms as a Richmond Councillor in 1894 and 1895 and one term as Reeve in 1900. In 1919 he traded the five acres of land purchased from his uncle by the Township for four acres of land at the present City Hall site. Wilkinson Brighouse passed away in 1932, leaving the property to his heirs who sold it to the Corporation of the Township of Richmond in 1962. Until its sale, Wilkinson Brighouse and his heirs continued to lease out their farmland to local farming families such as the McClellands, Shaws, Fishes and Zellwegers. The CPR train , “The Sockeye Limited”, at Steveston, ca. 1902. City of Richmond Archives photograph 1977 2 38. So the Brighouse name was very well known in Richmond throughout its early years, but how did that part of town retain the name over the names of some of the other pioneer property owners in the area? One explanation is because of the Canadian Pacific Railroad and the construction of the Vancouver and Lulu Island Line, the “Sockeye Limited” in 1902. Eyeing freight and passenger revenues from the canneries of Steveston and the farms which dotted Lulu Island, the CPR built the railway from the depot in Vancouver to Eburne (Marpole), spanned the North Arm of the Fraser with a bridge and built an eight mile track to Steveston where they built a large train station. Along the line where it crossed a road, still a rarity in Richmond at the time, three smaller stations were erected. At No.2 Road “Lulu Station” was built. At No. 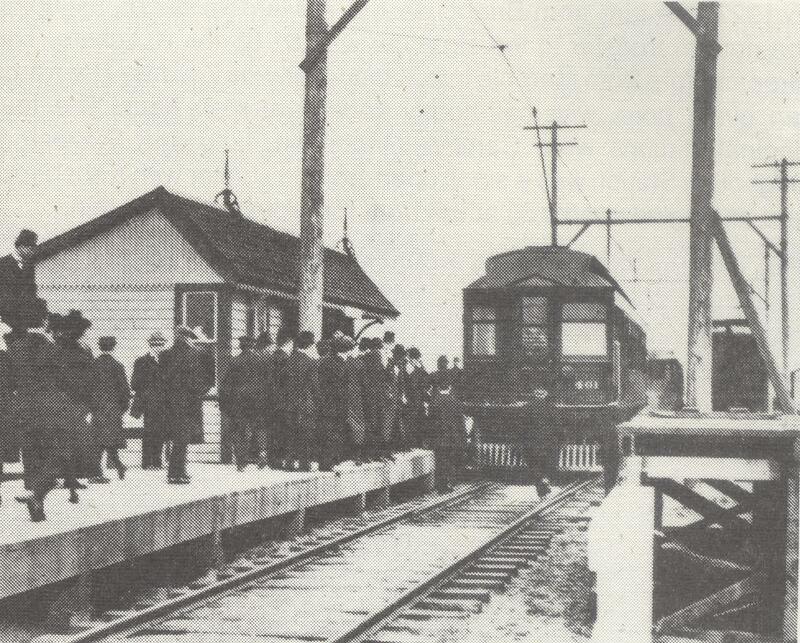 20 Road “Cambie” Station, named for Civil Engineer and CPR Executive Henry J. Cambie, was built. Where the track crossed No.3 Road near the southeast corner of the Brighouse property, owned by the man who had sold large amounts of his Vancouver property to the CPR and its officers, “Brighouse” Station was put up. It is often the case where railroad stations are placed, the surrounding area takes on the name of the stop and the Brighouse name was even further imprinted on the area in 1922 when the Brighouse Post Office was opened at the train station. By this time the second Richmond Town Hall had opened across No.3 Road from the station and its address became “The Corporation of the Township of Richmond, Brighouse, B.C.”. Detail of an envelope showing the return address for the Richmond Town Hall, 1922. From the personal collection of H.S. Steves. Businesses took on the name of the area and names like Brighouse Grocery, Brighouse Cafe and Brighouse Hardware let customers know their location and that they were near the tram station. As years passed Brighouse Subdivision was built on the old farm, served by Samuel Brighouse Elementary School. Brighouse Industrial Estates provided homes for large companies. Today the Richmond Olympic Oval occupies space near the river and condo towers rise where once Sam Brighouse built dykes to protect his farm. The Brighouse Cafe, shown here before 1940, was one of a multitude of businesses, services, organizations and retailers that used and continue to use “Brighouse” in their names. City of Richmond Archives photograph 2001 10 3. The name Brighouse has become synonymous with the commercial and administrative centre of Richmond and although the original train and tram station is long gone, a new Brighouse Station opened down No.3 Road from the original one in 2009 as the terminus of the Canada Line further connecting the name of Sam Brighouse to the history of Richmond. 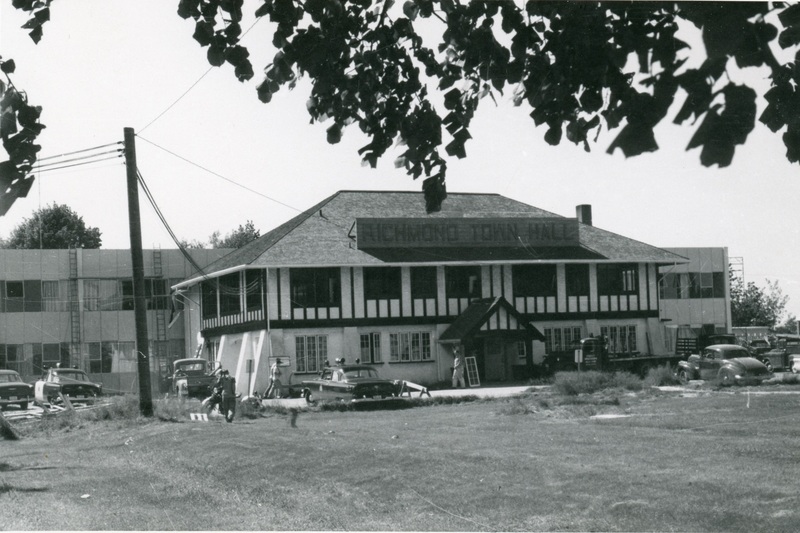 In January 1955 the Municipal Building Committee recommended to Council that a new, two-storey Municipal Hall be built immediately behind the existing one on the Municipal property at Granville Avenue and No.3 Road. By February the plans had been broadened to include a school administration building and health services offices on the same site and approval to borrow $398,000 was given by Council. The architectural contract was awarded to Allen C. Smith and Associates, the construction contract to Narod Construction, heating and ventilation to Crombie Heating and the electrical contract to Canadian Comstock. Construction of the new Town Hall takes place behind the old one in this photo. When the building was completed and the old one removed, the Cenotaph was relocated closer to the entrance. City of Richmond Archives photograph 1997 42 3 47. Construction on the site began with moving the Brighouse Fire hall to the southwest corner of the property, making room for excavation to begin. The building’s construction was of reinforced concrete and throughout the construction, changes and amendments to the plans were made, although one suggestion that a neon sign to identify the hall should be added to the plans was quashed. The location of the new hall allowed work to continue uninterrupted in the old Town Hall while the new building rose behind it. Work continues on the new Town Hall while business continues in the old one. City of Richmond Archives photograph 1985 7 14. By May of 1957 the hall was ready for occupation and municipal departments began to move their operations into the new building. 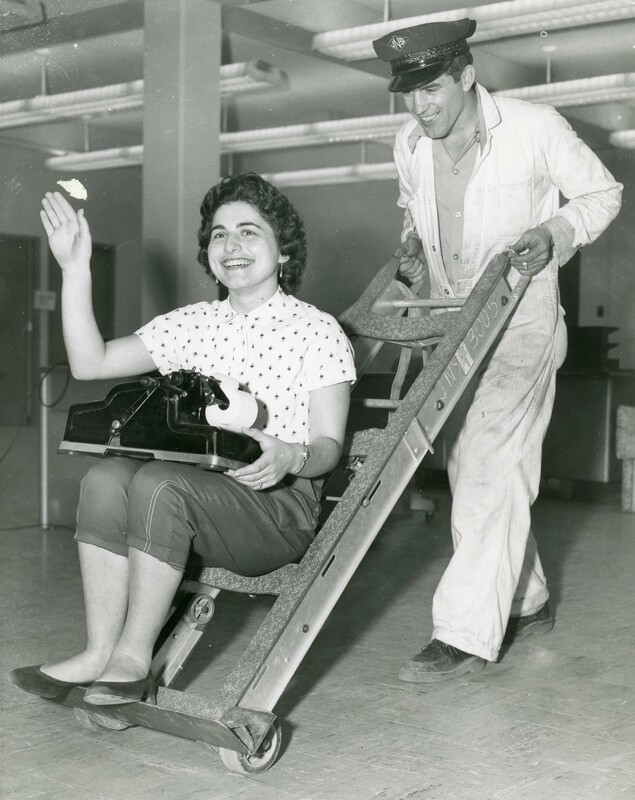 Municipal employee Nellie Grecan and her adding machine are moved into the new Town Hall on May 25, 1957. City of Richmond Archives photograph 1988 18 57. 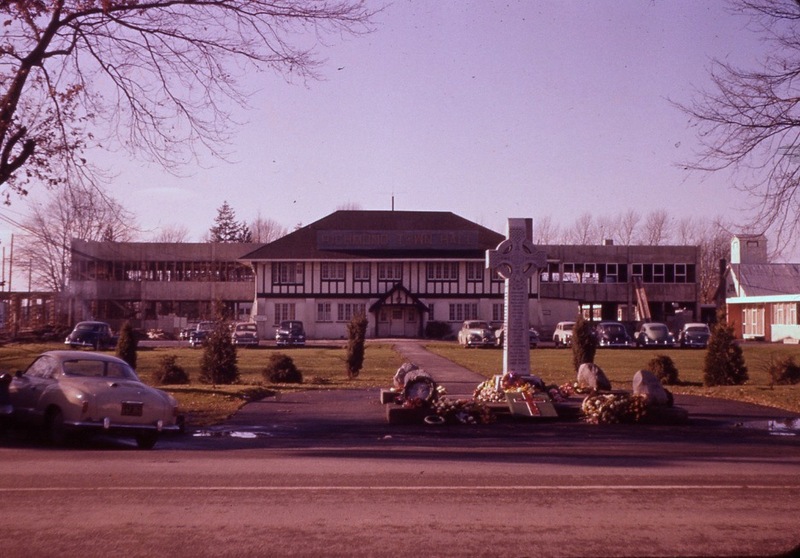 The demolition of the old hall was started, and once complete, landscaping, paving of the parking area and relocation of the cenotaph was completed in time for the grand opening on August 9, 1957. Once staff had moved into the new building, the old building was demolished. City of Richmond Archives photograph 1985 7 31. The opening of the new Municipal Hall was attended by the the Hon. Wesley Black, Minister of Municipal Affairs, and the Hon. Leslie Peterson, Minister of Education who opened the new School Board offices. 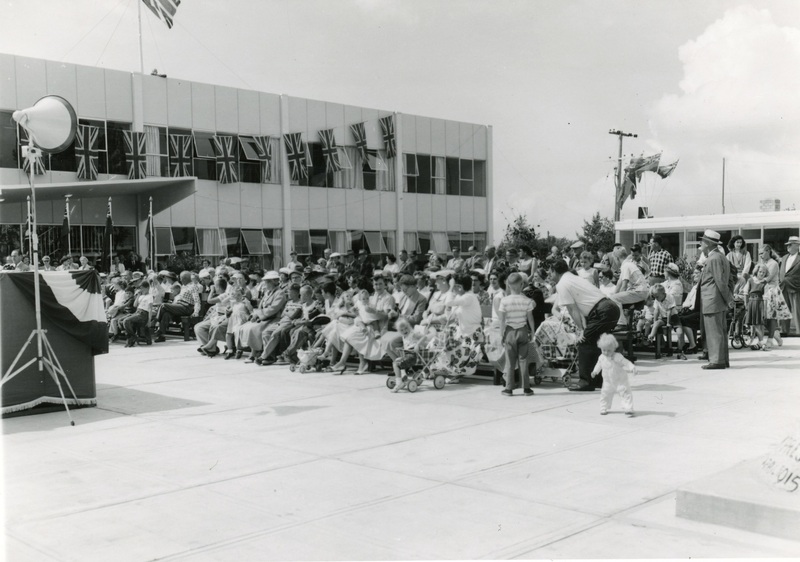 The crowd on the east plaza of the new Town Hall for the opening ceremonies, August 9, 1957. City of Richmond Archives photograph 1988 18 38. The new hall departed from its predecessor’s use as community space and community activities moved to community centres, church halls and other buildings. It was an unpretentious office building designed to house the growing bureaucracy required for the rapidly growing town, one which was growing far faster than could have been imagined. The new council chambers at the Municipal Hall with Reeve E.R. Parsons in the chair, Municipal Clerk Ted Youngberg seated below him and Councillor R.A. McMath in the foreground, Councillor H.D. Hudson seated on the far left, and Councillor Robert G Ransford at the far right. City of Richmond Archives photograph 1977 1 146. Photograph of the general office and municipal employees in the new Richmond Municipal Hall, 1957. City of Richmond Archives photograph 1977 1 148. 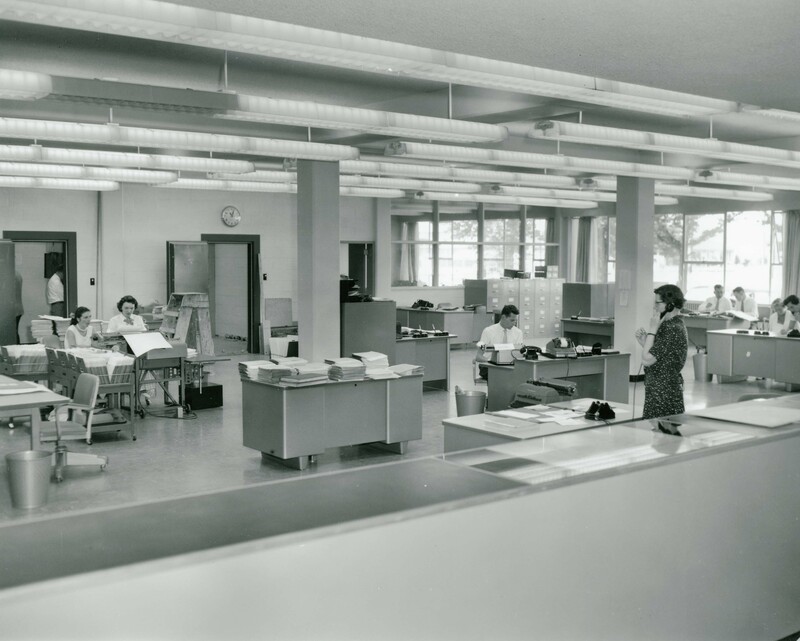 By 1961 office space was growing tight in the four-year-old building and debate was taking place on expansion of the hall. In 1964 the decision was made to add a new wing to the building. A contract was awarded to L.D. Boyd construction for $166,900 and the new wing was completed in September 1965. This alleviated the space crisis for a few years but improvements and modernization continued through the rest of the 1960s. The front entrance of Richmond Town Hall, ca. 1960. City of Richmond Archives photo 2004 11. Growth continued and in 1969, with the hall once again bursting at the seams, plans were being debated for further expansion. In 1971 $1,278,000 was borrowed for the construction of a third floor on the existing building and for the construction of a new Public Safety Building. The new building would allow the RCMP to vacate their space in Municipal Hall and move to their own building, freeing up valuable office space. The additional space provided by the third floor and the space cleared by the RCMP only lasted a short time in the rapidly growing municipality. 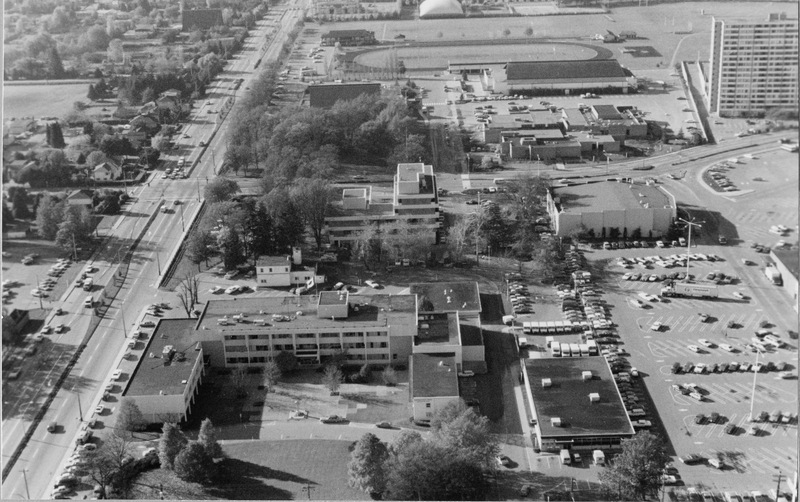 This photo from 1979 shows the Municipal buildings complex. Municipal Hall, with the third floor and additions at each end is in the foreground. The old Brighouse Firehall is in the space between the Hall and the RCMP Building and the School District Offices. To the right foreground is the Post Office and in the mall parking lot is the Richmond Square Theatres. City of Richmond Archives photograph 1992 20 F.
By January 1978 an architect had been commissioned to produce a report on the state of the council chambers and offices and how to increase the efficiency of the use of space in the hall. This report led to changes in the Health Department, a new Personnel Department and an addition to the north end of the building in 1979. Richmond City Hall, ca. 1992. City of Richmond Archives photograph 2008 39 6 705. In 1990 the Corporation of the Township of Richmond was reincorporated as the City of Richmond. Over the preceding decade Richmond’s growth had continued and accelerated with increasing immigration. Richmond’s old Town Hall’s days were numbered, the city once again outgrowing it’s office space.